Craft stores such as Michaels craft stores, that are online today. At least most of the major ones are. This is a wonderful convenience for anyone that doesn't have a store locally. Fabrics and notions are not always easy to find as in my case, so surfing the net provide the merchandise I need. I live in the country, miles from any local fabric stores and do much of my shopping and ordering online. I am very happy to be able to share with but will make note of the stores I know. Sharing with you and noting the online stores I personally have found to be dependable and reputable. I admit I like everyone else, I do have my favorites. But if you are looking for some fabric for a quilt or scrap booking materials, there are plenty of great stores to choose from. Some are brick and mortar stores, some are online and many of the stores are both. 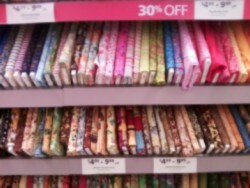 I admit I like Joanns fabrics but we don't have one here near us. So shopping online is necessary for me, I also admit it is also really nice to have my merchandise delivered to the door. You will find fabric, sewing and quilting supplies, scrapbooking and all kinds of craft items. I have not come across any craft item I needed that they did not carry. Fabric.com is a great way to shop online. Hobby Lobby: craft stores is one of the nicest I have been in and I never leave empty handed. I love their fabrics and yarn the most. Also they have some very good seasonal sales happen there. Hancock Fabrics has a very nice selection of beautiful fabrics but I do find the prices a bit higher than the other craft stores. Ben Franklin: craft stores are very nice but they are not in all states so the limited locations cause me some problems. I have not shopped here yet. So if you live away from the city and love your crafts don't give up because your supplies are really only a mouse click away.